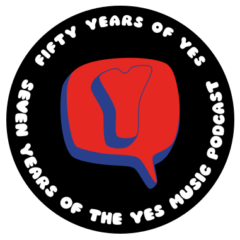 The fifteenth episode of the Yes Music Podcast featuring the fourteenth studio album, ‘Talk’. It’s the Big Generator line up – does it sound like it? Does Talk mark a return to progressive sensibilities? Is this just a Rabin solo project? Hi Kevin. Refreshing to hear your positive spin on Talk! I’m privileged to say that Talk (on its release) was my first Yes album proper, and it left an enormous impression on me (to this day). Not least of all it convinced me to work my way through the rest of the Yes back catalogue. I still love the energy and the bombast of the album, and it really sounds to me that Trevor Rabin was trying to expand the sonic and musical scope of Yeswest. That Trevor moved into film soundtracks shortly after the tour is no surprise! Thanks, Ben. You started with a great album! It’s always interesting to hear how fans got hooked. The forthcoming interview special with Joost is a case in point! Thanks once again, Paul! It’s great to hear some of your Yes stories and I’m very jealous that you have managed to meet some of my heroes! I’m desperately hoping that the band is able to tour again in the UK as I had to miss them this time. I wonder how long we will be able to say, “Just once more,” – I hope we can for a long time to come! Thank you for speaking so highly of my favourite Yes album. I was very apprehensive when I first put on this particular podcast. But you loved Talk. I think the world is a better place because of Talk. Genius of epic Yes proportions. Rabin made Yes his own and his own Yes. Justified and true. He is my Howe of the fans that remember the classic Main Sequence days. Talk was my Main Sequence. Glad to hear you agree with me about Talk. I often have it on full blast in the car! Great, heavy, creative prog. Thanks for the comment! ……would like to have seen where TR would have taken Yes next. Will never know. I think “Endless Dream” is right up there with some other classic Yes masterworks. I’m glad I got to see them do it live and it’s a pity that we’ll never see & hear them do it again. Thanks for the link, Ken. I agree – it’s such a shame that these songs are ‘lost’ to the Yes concert-going public! Maybe one day…? Yes, it’s fantastic and should have much more exposure. Thanks for the comment!